Advice on Replacing Reefer / Freezer Compressor? We're in Mexico and we have no cold beer. That's how serious this problem is. We have an AC compressor that runs two holding plates, one for the fridge and one for the freezer. While we were living at the dock, this system worked great. However, the first time we ran it through the inverter away from shore power and with the engine off, we saw how much energy this thing pulls. 70 amps. Not 70 amp/hours a day. 70 amps of current draw. That's the startup cost. According to the previous owner, once the boxes cool down, it will run at 30 to 40 amps. He told us he budgeted 200 amp/hours per day for this thing. Screw that. Anyways, we've long since decided this thing needs to go. We probably want some kind of air-cooled 12V compressor but are open to other possibilities that do not require drilling a hole in the boat. We'd also prefer to not replace a through hull if we don't have to. The current compressor is water cooled so we have a raw water source if we want it but I'd rather go with the lower amperage requirements of an air cooled system if we can get away with it. We want to be able to remain in an anchorage for a week or more without running the engine which rules out engine-driven compressors. We're willing to add more solar to our existing 240 watts or a wind generator if that's what we need to do to get cold beer. Just don't want to put no-load hours on the engine and don't really want to smell petroleum exhaust while sipping my sundowners. * We want to keep the fridge cold: say 35 degrees. Freezer doesn't need to keep ice cream but should make ice for said sundowners. Say 25 degrees? * Cruising area is currently Mexico and will likely only get warmer from here on out. Hopefully the South Pacific after our cruising kitty gets a boost. * If I buy reefer brand X (Adler/Barbour, Frigoboat, Seafrost, Novakool), what value add am I getting vs. just buying the components seperately on Defender.com and putting it together myself? Aren't they all using Danfoss compressors anyways? * We already have two beefy stainless steel holding plates. Is it worth it keep those and just replacing the compressor and refrigerant lines? Can I do that without leaking refrigerant everywhere? The guy at Kollman Marine seems to recommend evaporator plates over holding plates. I didn't spend the time to really understand why. OK, that's all for now. Thanks for reading and thanks in advance for any info. I haven’t enough experience with my just installed unit to to offer any advice. I would think that you may need a substantial increase in your solar array if you plan on getting enough juice to go a week between charges. I'm thinking there are some clever ac type folks here that will give some REAL advice. In the mean time you may be able to reduce the number of cycles by filling any excess spaces with bottles (or whatever) of water ...I think the more densely packed the more thermal mass….the less cycles….not sure if that actually means less energy? Read the bottom line. We spent a lot of time in the Sea, Our boat is in Mazatlan now and we will be returning to it soon. Our boat is our bedroom, the world has become our living room. I have dealt with Cleave Horton, of Seafrost. This summer I had to replace our complete refer. Cleave can be reached by phone or email, and will give you good advice, and backs it up with great customer service. You wind up dealing with an owner, not a salesperson. It DOES keep the beer cold. I can second that recommendation. Installed two compressors (fridge, freezer) in remade boxes last summer and had great experience. Can't say the same about the local rep for SeaFrost but the company was a pleasure to deal with and so far so good on the systems. We just installed an Isotherm 2016 unit with danfoss 12v compressor - we actually have the opposite problem now in that our ice box is too cold even with the thermostat at the warmest setting (we actually have one unit for fridge and one for the freezer). Max draw is about 6A but I haven't confirmed this yet. Very simple to install - you don't even have to worry about charging it as there are quick-connect settings. You have to bend the evaporator plate to suit your box but there is a bending tool included in the package with instructions on how to accurately calculate the bend locations. The fridge unit cost us just over $1200. Jason, your problem with refrigerator’s daily power requirements is the same as other boaters have with large boxes and insufficient aged insulation. I have seen a number of boats like yours converted from large 110 volt and engine drive refrigeration to 12 volt with disappointing results. Currently there are a number of these systems with compressor and or module failures caused by eutectic holding plates with oversized evaporator coils inside. Typically your present 11 cu ft combination box in a warm climate, seawater 80+ degrees F, with 3 inches of good dry insulation consuming about 160 amp hours per day using 12 volt refrigeration. Assume 10 amp-hrs for each cu ft of refrigerator per day and 20 amp-hrs per day for each cu ft of freezer in a warm climate. Boats house battery bank needs to be sized for four times the boats total daily amp-hr usage. Alternator needs to be sized and run long enough to replace daily amp-hrs used each day to obtain reasonable battery life. Solar panels can reduce daily engine run time. One cu ft of refrigerator in a tropical climate will operate daily on a panel rated at 50 watts. Each cu ft of freezer will require a panel ratted at 100 watts. Surveys show that wind generators deliver about ½ the advertisers clams but are a good source of alternative energy. Recommended insulation surrounding refrigerated boxes for tropical climates below Latitude 26N is a minimum of 30R value. The estimated power consumption figures above can be reduced by 2% for each degree of cooler seawater below 80 degrees F in your planed cruising area. 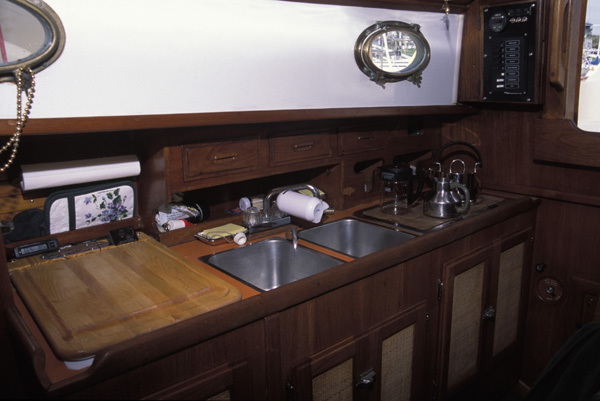 When it comes to selecting a 12 volt refrigeration system for a live aboard boat I do not think you will find a more reliable performing unit than an air-cooled condensing unit with a Danfoss BD compressor. Thin plate evaporators when capacities are matched to condenser will produce the best performance. Experimenting with unproven designs when selecting a system will result in a waste of money. It is Difficult to justify eutectic holding plates for small condensing unit refrigeration as their only benefit is to store energy. When refrigerated boxes are small enough and batteries are fully charged surplus alternative energy available from solar or wind can be diverted to eutectic holding plates.. Thanks everyone for the reply! Great information. Based on advice gleaned from Richard and Richard's website (which is bomb-diggity by the way) and reading up on Nigel Calder and Practical Sailor, I've decided to go with an air-cooled 12V compressor and evaporator system. I've also decided that I need to rip out the current 11 cu.ft. box that's in there and replace it with a much better insulated 4.6 cu.ft. box that will house a refrigerator with a small space to freeze ice and hold it. I measured the space and should have an minimum of 5 inches of insulation in some spaces but closer to 8 inches at the bottom and along the hull. With a well insulated box and a 12V air-cooled compressor, I think we can be pretty much energy neutral with 375W solar panel array. That means I'll need to add a 130W panel but I'll be doing that anyways. As for the AC compressor and holding plates that are in there now, I think I'm going to have to have someone come out and pull the refrigerant out. I don't know anything about dealing with refrigerant. I'm pretty sure it's an older R12 system. We fitted a little Isotherm GE80 last spring into an existing cool box. Straight forward fit and works realy well. Indeed for a draw of about 2-3 amps an hour keeps everything cool on a half setting. Where possible we increased the insulation but one side is hard up against the cooker bulkhead Final outer layer was polystyene foil covered stuff with edges taped, particularly the outside bottom edge. The weak link is the lid at only an inch think, but I have had enough of fitting kitchens at home so not taking the boat apart if I can avoid it. Needs a wipe every other day in the summer as condensation really builds up inside as does the ice if it is set to high. However we are in NW Europe with sea water temperatures colder than your fridge. If you are in Mexico might be worth a bit of re-search on 12 volt water cooled fridges. I think the cooling pipe is connected into an existing through hull to disipate the heat. The efficiency should be greater. Certainly worth some time googling over Christmas.